The museum is located on the ground floor of a nineteenth century The Hague town house in Archipelbuurt, the quarter of town where many characters from Couperus’s novels dwell. Couperus knew the neighbourhood well. 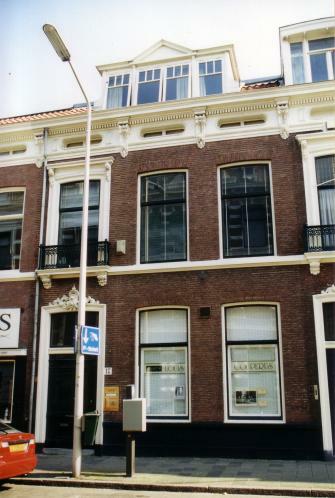 When a boy, he lived at Nassauplein and he wrote his first novel, Eline Vere, around the corner from the museum at 20, Surinamestraat. Since 1963, the square in front boasts a bronze bust of the writer. Louis Couperus never lived at 17, Javastraat. This house belonged to Albert Vogel (1924-1982), a The Hague solo-actor who impersonated Couperus on stage in what he called ‘literary one-man shows’. Also, he published a biography on the author. The Louis Couperus Museum aims at promoting interest in Couperus’s work in The Netherlands and abroad. The first room of the museum displays objects from Couperus’s personal life and property, such as his desk and portraits of his relations. All these artefacts are on loan from the Dutch Literary Museum (Letterkundig Museum), which owns the most important collection of Couperiana in the country. This construction guarantees the conservation of unica from Couperus’s life. In the second and garden rooms, the Museum organises two yearly exhibitions around various themes from Couperus’s work or life. Every exhibition is accompanied by a richly illustrated catalogue which is displayed in the museum in a large page turner, the so-called ‘Couperian windmill’. The Louis Couperus Museum owns a lifesize image of Couperus which was created by the Rotterdam artist Sjoerd Didden. The doll is dressed in a nineteenth century ‘costume de soir’, a gift from Koninklijke Meddens BV, the genteman’s fashion department store where the dandy Couperus used to buy his clothes.